Belleek box is for baby's first cut of hair. Sorry, this Belleek baby gift is now sold out. 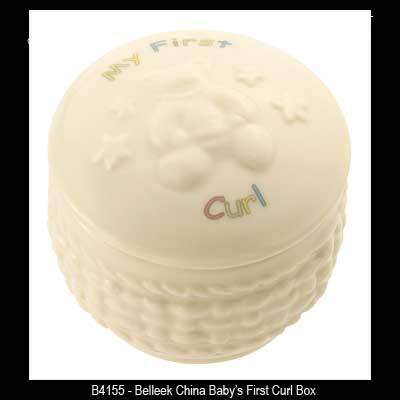 The baby's first curl box, from Belleek China, was introduced in 2014. This Irish baby box from Belleek China is designed to hold a first lock of hair. The baby's first curl box features the painted words My First Curl along with an embossed Teddy bear and stars on the lid; the Galway weave pattern embossed on the base. The Belleek baby box measures 1 3/4" wide x 1 3/4" tall and it is hand crafted and hand painted in Belleek, Ireland. Blue and pink ribbon is also included to tie baby's hair. The Irish baby gift is made of fine china and it is gift boxed, complements of The Irish Gift House. This Irish baby gift from Belleek is a china cup with green shamrocks and an embossed basket weave pattern. Belleek baby cup for a girl is crafted of fine china with an embossed bunny and pink accenting.